PARK CITY, UTAH – Sundance is a proving ground for idiosyncratic independent visions exploring niche issues. It's the sort of exploratory festival where you can catch a documentary on whether the Internet dreams of itself or see horror legend John Carpenter appearing in a short about a supernatural killer or watch a Peru/Qatar coproduction dramatizing the environmental fate of the Amazon. It's also a launching pad for the year's coming mainstream hits. "Brooklyn," with nominations for best picture, best adapted screenplay and best actress debuted here (read my review). And this year's presentations feature several features likely to spark wide mainstream attention in the run up to next year’s awards season. 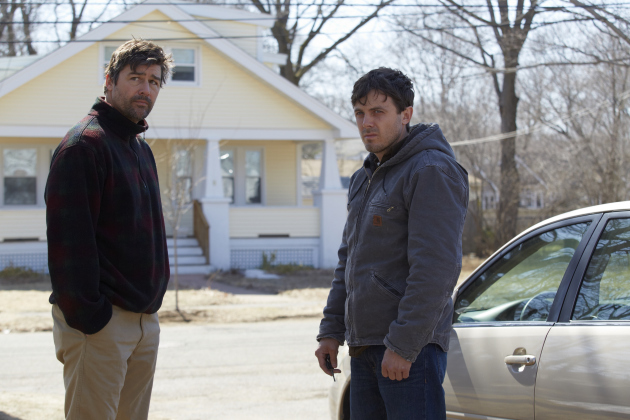 "Manchester by the Sea": Kenneth Lonergan's touching film (photo above) seems likely to equal or surpass "Brooklyn" in next year's Academy Awards contest. A wise and humane drama about the complicated lives of a blue collar East coast family, it shows Lonergan ("You Can Count On Me") in masterful form as both a writer of relatable characters and a director leading viewers to spasms of laughter, then truly felt cheek-wide tears. As a man facing a legal challenge that resurrects a long-buried family crisis, Casey Affleck gives the kind of performance that raises the bar so high it breaks the bar. Lonergan's characters speak to each other precisely like real people, and somehow that small talk communicates in a way that is deep and profound. It is real life and pure artistry hand in hand. "Weiner": Here is a fine portrait of political campaigning in the internet age. With remarkable fly on the wall access to scandal-plagued Anthony Weiner's New York City mayoral campaign, directors Josh Kriegman and Elyse Steinberg capture both his complex personality and the media's relentless focus on controversy and scandal. While Weiner works to rebuild the political career that his online sexting emails torpedoed, his views on substantive issues are submerged over ongoing reports of earlier mistakes in his private life. It's an unsparing but compassionate comedy of errors, with his wife's facial expressions of anxiety, empathy and disappointment acting as a silent Greek chorus to the saga's tangled web of surprises. "Hunt For the Wilderpeople": Stories about grumpy old men being humanized by charming young rascals are standard crowd-pleasers. That's merely the blueprint of "Hunt For the Wilderpeople." The uproariously funny New Zealand charmer follows Julian Dennison as a pre-teen troublemaker taken in by a farming couple, and Sam Neill as the crusty foster parent whose hiking retreat into the mountainous bush with the boy triggers a nationwide manhunt. The pair forms a cantankerous friendship as they cross paths with outback blockheads, a tough as nails child protection services officer, and the country's extremely small army. It's easy to see why Marvel recruited director/screenwriter Taika Waititi to helm the next "Thor" movie. His walk-on appearance as a sub-standard preacher flubbing a funeral is a highlight on its own. "Miles Ahead": Mixed Blood Theater alum Don Cheadle directed, wrote and stars in his passion project "Miles Ahead." It turns the late-career comeback of Miles Davis into a mix of fact-based biography, thriller and fantasy. His impersonation of the jazz genius is remarkably accurate, and his unlikely relationship with Ewan McGregor as a Rolling Stone reporter who becomes his partner in drugs, boxing, crimes and stick-it-to-the-man rebellion is an entertaining new take on buddy comedy. "Swiss Army Man": Granted, none of those films has the go for broke weirdness of "Swiss Army Man," starring Paul Dano as a shipwrecked would-be suicide. He is drawn back to living when a corpse played by Daniel Radcliffe washes ashore with a chatty streak and endless flatulence that makes him useful as a jet ski and bazooka. Turning Harry Potter into Harry Potty isn't for many people's taste -- certainly not mine -- but like I said, Sundance has something for everybody.